When Bill Leary mentioned to the Computer Diva he needed to recover his website, Mary knew just who to call. The previous webmaster had cancelled the hosting, hijacked the domain name, shut down email addresses for the business, and refused to do updates on the site. It was time to get Sirius! This was a a prime opportunity to refresh some of the content and completely redesign the look of the site. The site is now mobile friendly with a warm, engaging look and feel. The site highlights Bill’s advanced training as an entomologist and their one-year guarantee on most services. Steven Potter bought the business he’d been working at for decades. It is a unique business servicing a specific market — people who need a power brake booster rebuilt. Business founder Dewey had been an old-school guy and had been using an old-school html site. He didn’t use email and would send us his annual site edits by mail. When Steven took over the business, he knew the site needed a rebuild. We kept it simple with an a basic one page site layout that incorporated the price list from the original site, but also had click to call phone numbers, downloadable shipping forms, and easy to access hour and location information. A background panel featuring one of their workbenches adds a storytelling image to set the tone and style of the site. Since their customers are into restoring classic cars, we added a Gallery of Boosted Cars that feature Power Brake Boosters restored at the Power Brake Booster Exchange. When Mary Jadwisiak decided to broaden the scope of her business, she knew it would involve updating her website. The previous theme was outdated and was not usable on mobile devices. She was ready to shift the brand of her business beyond her own identity, was bringing in new teaching consultants, and had plans to offer online webinars. It was definitely time to move up! We had fun brightening up the look and feel of the site with more engaging photography and providing a stable platform on which to conduct the new training. By combining the power of her website and online scheduling tools such as Eventbrite, she can access powerful social sharing after registration, check in lists and more. The online store has been updated to feature the new webinars. Mary’s mission is to provide support and training to those who work in suicide prevention. It’s a joy to support her important work. Gary Wass and Sarah Blattler had decided to rebrand their practice. They were ready for a new business name, logo and online identity. Both of them are experts in massage therapy, plus Gary is also an accomplished Tai Chi teacher. We worked to find a mark that would reflect their approach to both specialties and communicate their motto “Move For Life!” with a palette of bold rich colors. The website shows both sides of their approach to movement for life. Now clients can make massage appointments, pay for Tai Chi classes from mobile devices, find out when the next class is, click to call for information, or learn more about massage offerings. 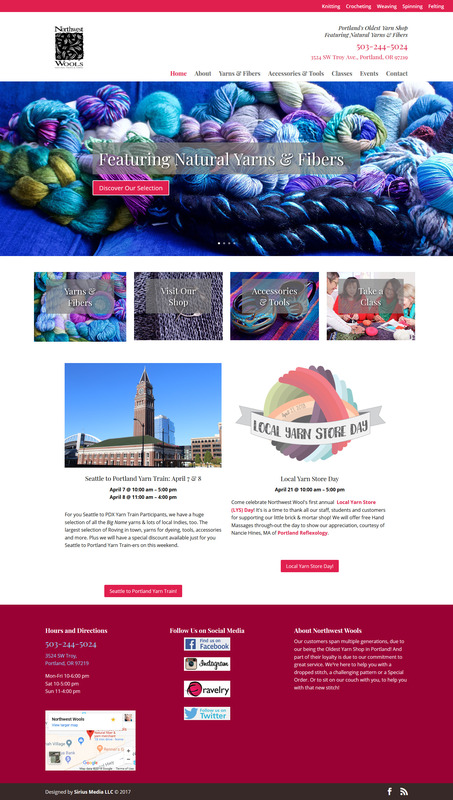 It had been 4 years since client Jackie Kraybill had originally asked us to design her website, Northwest Wools. It had served the purpose well, but the theme and layout did not adapt to mobile devices. We made up for that lack by using a mobile plugin, but that required a separate monthly update routine in addition to the regular site updates. What a hassle! We worked closely with Jackie to develop a site layout that was simple, engaging, easy to use, and designed to showcase her monthly events and wide range of yarn offerings, accessories, tools, and classes. Working with the wonderful images provided by Tim Sturgeon, we created an easy to use online showcase that has increased traffic using mobile devices many times over what it had been a year ago. Working with Fellene on my new website was a delight. She patiently and professionally guided me through the easy and the hard parts. She has great design sense as well as excellent web coding skills—a rare combination. I especially appreciated that she was on top of every detail, responded quickly to my requests, and was unflappable when I changed my mind. Thanks so much for the great attention to detail and making sure all these small but critical things are working as they should! This is what separates the men from the boys in consulting work! Sorry to use such a sexist analogy, but it is so apt. Fellene was great to work with and the website she created for me is exactly what I wanted! I couldn’t give anyone a higher recommendation. I hope you know how pleased we are with your work. It’s been such a pleasure collaborating with you. Thanks for all your hard work, skill, patience, expertise, flexibility, and good humor. At the end of the project she topped it off with a great training session build around a wonderful guide with everything I need to know to maintain the site. For companies, especially small one, who want a site that looks like it costs a lot, but want great value for a reasonable price, contact Fellene. I may be your sister but I’m still your biggest fan. I know you’re a fabulous designer. I applaud your ambition to follow your dream! Love you always. Thank you for putting me out there into media-land. You are the absolute best! Sirus Media created my website in record time. Fellene Gaylord not only created a BEAUTIFUL website, she seemed to intuit on some grand level exactly what I was visioning. The process was so painless and her follow-up help so handy, that if I needed multiple sites, Sirius would be my go to for sure! I greatly appreciate your professional and organized approach to collaboratively co-creating my website! You kept us on time and on task, gracefully, I am thrilled with the finished product! I am very pleased with the site updates. Thank you so much! Sirius Media has been providing smart websites for small businesses from our office in Portland, Oregon area since 2007. Sirius Media provides expert WordPress website design and support services from offices in Portland, Oregon. We are passionate about creating online experiences that are both effective and fun. is where our clients get secure, reliable hosting, unlimited bandwidth, free domain registration, free domain privacy, free SSL certificates, and the best support. Get Tigertech Today!